Information and ruminations on the business of healthcare from veteran healthcare journalists. Summa Health System’s care coordination network of skilled nursing facilities (SNFs) is working to decrease fragmentation, length of stay and unnecessary readmissions while improving outcomes of care. Mike Demagall, administrator of Bath Manor & Windsong Care Center, a participant in this network, identified five barriers to patient care that originated in the acute care setting. First, we found a lack of quality information received upon transfer from an acute care to a nursing facility and the lag time in identification of post-acute bed availability. The social worker was calling or faxing information to a facility, and the facility took up to 24 hours to respond as to whether a bed was available. That person may have been ready that day; instead it postponed that discharge another day. We also had barriers to the patient’s acceptance of the need for post-acute care. Social workers and care coordinators at the bedside tell them when it is time for rehabilitation. The next barrier was family expectations. Does the family feel that they need to go to the nursing home? The hospital staff and the insurers had to spot the appropriate levels of care. One of the concerns we had was, ‘Is this going to send a lot of our patients — our referrals — to home healthcare and decrease our referrals by participating in this?’ That happened to not be the case at all. 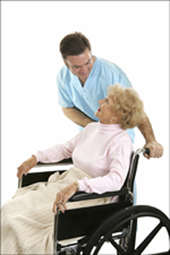 There was still a lack of knowledge and respect toward long-term care (LTC). All the discharge planning individuals, which were the case manager nurses and social workers, were able to tour the facility. Each facility had the opportunity to present their services and what they do. That helped with the overall cohesion of the group, and it moved this project forward. There was also a lack of quality information received from the nursing facilities on the transfer to an emergency department (ED). That was information that we needed to get back, just as we were asking for information as those residents were coming in. Developing post-acute partnerships with home health organizations is one of the three top ways healthcare professionals are seeking to reduce readmissions, according to more than half of the respondents to the Healthcare Intelligence Network’s fourth comprehensive Reducing Hospital Readmissions Benchmark Survey. Almost three-fourths (67 percent) cited skilled nursing facilities (SNFs) as their preferred post-acute partner, and 50 percent said they were partnering with hospices to reduce readmissions. Other partnerships cited included telemedicine, free/low cost clinics, physician networks, and transitional care programs. Nearly all of the respondents said that partnering with post acute providers helped them to streamline processes, educate their staff, and implement effective changes of value to the patient. Among respondents from hospital systems (42 percent) that partnered with home health organizations, identifying high risk individuals most likely to be readmitted post-discharge and communicating this information to providers was key to successfully averting readmissions. Involving the patient’s designated caregivers in follow-up dialogues and transactions also improved the odds of prevention. In addition to post-acute correspondence with their home health organization within 24 hours of discharge, one hospital system also practiced medication reconciliation and education and physician scheduling. Follow-up appointments for patients with their home health and/or SNF provider within seven days for Medicare and Medicaid patients with no primary care doctor factored into one hospital system’s readmissions prevention plan. Assuring that medication reconciliation information was made available to their post discharge providers, particularly for high risk utilizers, was also critical to prevention. A hospital system that partnered with low-cost clinics in addition to home health organizations maintained daily and weekly telephonic education meetings with patients, coordinated by its diabetes disease management nurse, diabetes educator and clinical pharmacist. The ultimate goal in partnering with post-acute providers was to engage with patients while in their facility and continue to follow up with them upon discharge, with continued education and teach back as well as monitoring and overseeing their patients’ progress. Infographic: Where Do Discharged Patients Go? An analysis of 2010 Medicare claims data by Avalere Health found that discharged Medicare patients are not following their discharge plan for the next site of care. Of the 41,859 Medicare beneficiaries coded as being discharged to short-term general hospitals for inpatient care, fewer than one in four patients actually went to another short-term general hospital. To see where patients leaving the hospital actually went for their post-acute care, view this new infographic by Avalere. Get the latest healthcare infographics delivered to your e-inbox with Eye on Infographics. Click here to sign up today. Posted in Hospital Readmissions, Infographics, Post-Acute Care | Comments Off on Infographic: Where Do Discharged Patients Go? Download this FREE report for data on the top clinical targets of healthcare case managers; the top means of identifying and stratifying individuals for case management; and the most common locations of embedded or colocated case managers. Download this free report today.